My research interest is focused on the relation between properties and microstructure of materials, and how properties and microstructure are affected by processing, heat treatment and in-service exposure (for example temperature, stress, oxidation, wear and irradiation). The main tool for my research is atom probe tomography, but I also apply electron microscopy, SANS/SAXS and other techniques. I have mostly worked with metals (steels, nickel-based alloys and zirconium alloys), but also wear resistant thin films, thin film solar cells and zeolites. Currently, I mainly work with materials for nuclear applications, including reactor pressure vessel steels, zirconium fuel rods and accident tolerant fuel (ATF). 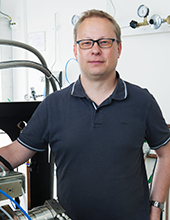 There might be more projects where Mattias Thuvander participates, but you have to be logged in as a Chalmers employee to see them.